1. Crowds will get heavy around March 13th as people enjoy their Spring break at Walt Disney World. The early part of the month will have low to moderate crowds. Low crowds mean shorter hours and fewer shows so plan accordingly. 3. SpectroMagic Parade (Magic Kingdom) – This wonderful nighttime parade is not offered every night and the Magic Kingdom will be more crowded on days featuring a SpectroMagic Parade. The SpectroMagic Parade will be presented on March 1, 3, 6, 7, 8, 10, 12, 13, 14, 15, 16, 17, 18, 19, 20, 21, 22, 25, 27, 28, 29, 30, 31. If Disney offers a second evening parade, the later parade will be less crowded than the earlier. Any day that the Magic Kingdom offers both an Extra Magic Hour(s) and SpectroMagic Parade will be especially busy. 5. Extra Magic Hours – (Special hours only available to Disney resort hotel guests) – We strongly recommend that everyone avoid the Extra Magic Hour park of the day during Spring Break. Disney has 33,000 hotel rooms and no one goes to Disney alone – that means too many people are pointed in the same direction at the same time. You’ll have a much nicer time by going to a less busy park. This is doubly important if you are not staying at a Disney resort – you don’t want to get to the theme park and find a bunch of Disney guests in line in front of you. 7. Magic Kingdom & Animal Kingdom Open Early– Spring Break. The Magic Kingdom and Animal Kingdom theme parks will open at 8:00AM for all guests from March 28thth – April 10th. This is an hour earlier than the typical opening. You’ll want to be at the gates by 7:45AM to take advantage of the shortest lines of the day. 8. A good touring plan will keep you ahead of the crowds and out of the long lines. You can spend your spring breaks in line or you can use a touring plan will make sure you see and do the things that are important to you in a way that keeps lines to a minimum. We provide three choices for custom touring plans – 1) a subscription to Tour Guide Mike, a highly respected online planning service and Disney planning community with 45,000 members, 2) the 2010 Unofficial Guide to Walt Disney World, the most popular guide book available with information on every resort, restaurant, attraction and activity, and 3) our Custom Service, where we select the most appropriate touring plans and provide advice for customization for your specific group based on your preferences – at no charge to you when you book your trip through Build A Better Mouse Trip. 1. Epcot’s Flower & Garden Festival – March 3 – May 16, 2010. No extra ticket needed – included with your park admission. Expect Epcot to be in full bloom with flowers, topiaries, gardening demonstrations, and special activities. Mickey’s Toontown Square – date to be announced. At some point, Mickey’s ToonTown Fair will close as Disney begins a major expansion on Fantasyland. Free Theme Park Touring plans that keep you ahead of the crowds and out of the long lines. Or, if you prefer to do your own plans, we will provide either a subscription to Tour Guide Mike or the newest edition of The Unofficial Guide to Walt Disney World to you instead of our touring plans. The choice is yours. You can purchase vacation planning services & touring plans from us but most of our clients get them for free. We accept Disney and other hotel commissions as payment for our planning services. If you’ve already booked your own reservation, it may be possible to have our name added as the agent of record. Your rate, confirmation, and benefits all stay exactly the same. In this situation, Disney just pays us the commission they would’ve kept for themselves. Then – free to you – we provide you with touring plans that let you enjoy more attractions with less lines. 1. Presidents Day Week & Mardi Gras – February 13 – 19, 2010 – This year a 3-Day weekend & Mardi Gras fall on the same week in 2010. Each of these always increases the crowds a bit but the combination of the two will cause crowds to climb to the moderately high level. Disney doesn’t have specific Mardi Gras events but it does draw a good number of Louisiana residents fleeing their own state as the crowds come in to party. Universal Orlando also has some Mardi Gras related activities that bring some people into the Orlando area. Have a good touring plan to help you manage crowds. 4. SpectroMagic Parade (Magic Kingdom) – This wonderful nighttime parade is not offered every night and the Magic Kingdom will be more crowded on days featuring a SpectroMagic Parade. The SpectroMagic Parade will be presented on February 1, 3, 6, 8, 10, 11, 12, 13, 14, 15, 16, 17, 18, 19, 20, 22, 24, & 27. If Disney offers a second evening parade, the later parade will be less crowded than the earlier. 5. Extra Magic Hours – (Special hours only available to Disney resort hotel guest)! Crowds will be low for most of the month and these low crowd times are really the only time we recommend taking in the Extra Magic Hours. We recommend that everyone avoid the Extra Magic Hour park February 12th – February 19th. Disney has 33,000 hotel rooms and no one goes to Disney alone – that means too many people are pointed in the same direction at the same time. You’ll have a much nicer time by going to a less busy park. This is doubly important to pay attention to Extra Magic Hours if you are not staying at a Disney resort – you don’t want to get to the theme park and find a bunch of Disney guests in line in front of you. 6. A good touring plan is still important during low crowds. Shorter hours and fewer show times mean that some advance planning will make sure you see and do the things that are important to you. We provide three choices for custom touring plans – 1) a subscription to Tour Guide Mike, a highly respected online planning service and Disney planning community with 45,000 members, 2) the 2010 Unofficial Guide to Walt Disney World, the most popular guide book available with information on every resort, restaurant, attraction and activity, and 3) our Assisted Service, where we select the most appropriate touring plans and provide advice for customization for your specific group based on your preferences – at no charge to you when you book your trip through Build A Better Mouse Trip. 2. Celebrate Tonight – Downtown Disney’s West End Plaza. Mini Street Parties featuring a DJ and stilt walkers lead dances, the limbo, party games, and sign-alongs. They only last about 20 minutes each but are a lot of fun. Sunday – Thursday: intermittently 5:00pm– 11:00pm. Friday – Saturday: intermittently 6:00pm– Midnight. Check on the hour and half hour. If you find this report helpful, please consider using us to book your vacation reservations or for theme park touring plans. We are authorized Walt Disney World Vacation Planners and book directly with Disney so you never pay more than if you booked the reservation yourself. Then we provide lots of help and advice designed to take the stress out of vacation planning. Theme Park Touring plans that keep you ahead of the crowds and out of the long lines. We will provide either a subscription to Tour Guide Mike or the newest edition of The Unofficial Guide to Walt Disney World or assist you with our own plans. The choice is yours. 1. Spring Break & Easter Week – The weeks immediately before and after Easter are the when the majority of schools close for Spring break. The theme parks will be at their most crowded during then. The Magic Kingdom and Animal Kingdom theme parks will open at 8:00AM for all guests from March 28th- April 10th. This is an hour earlier than the typical opening. You’ll want to be at the gates by 7:45AM to take advantage of the shortest lines of the day. 2. Easter – Sunday, April 4th. You’ll want to avoid the Magic Kingdom and Epcot on Easter Sunday as these will be the two most crowded parks of the day. 4. SpectroMagic Parade (Magic Kingdom) – This wonderful nighttime parade is being offered more nights than usual the Magic Kingdom because of the Spring Break crowds. The SpectroMagic Parade will be presented on offered April 1, 2, 3, 4, 5, 6, 7, 8, 9, 10, 11, 12, 14, 15, 17, 18, 19, 20, 22, 25, 26, 27 & 29. If Disney offers a second evening parade, the later parade will be less crowded than the earlier. TIP: Avoid the Magic Kingdom on April 25th, if possible. This is the first day with evening entertainment after two nights of early closures due to the Disney Grad Nights – expect heavy crowds. 5. Extra Magic Hours – (Special hours only available to Disney resort hotel guest)! We recommend that everyone avoid the Extra Magic Hour park of the day. Disney has 33,000 hotel rooms and no one goes to Disney alone – that means too many people are pointed in the same direction at the same time. You’ll have a much nicer time by going to a less busy park. This is doubly important to pay attention to Extra Magic Hours if you are not staying at a Disney resort – you don’t want to get to the theme park and find a bunch of Disney guests in line in front of you. 1. Epcot’s Flower & Garden Festival ~ March 3 – May 16, 2010. The landscaping at Walt Disney World is always beautiful but everything is even more amazing during this festival (included in the cost of admission). Gardeners will find tips, displays, and special events just for them. Those who don’t sport green thumbs will also enjoy the beautiful topiary, Pirates Adventure Zone, Pixie Power Playground, and the popular “Flower Power” concerts. 2. Disney Grad Nights (Magic Kingdom) – April 23, 24, 30 & May 1. The Magic Kingdom will close early (generally at 7PM) for these special nights just for graduating high school seniors. The Magic Kingdom theme park will not have a SpectroMagic parade or Wishes fireworks on the days that it closes early for the Disney Grad Night events. 3. Celebrate Tonight – Downtown Disney’s West End Plaza. Mini Street Parties featuring a DJ and stilt walkers lead dances, the limbo, party games, and sign-alongs. They only last about 20 minutes each but are a lot of fun. Sunday – Thursday: intermittently 5:00pm– 11:00pm. Friday – Saturday: intermittently 6:00pm– Midnight. Check on the hour and half hour. Mickey’s Toontown Square (Magic Kingdom) – dates to be announced. At some point in 2010, Mickey’s ToonTown Fair will close as Disney begins a major expansion of Fantasyland. What Is A Dole Whip and How Can I Get My Hands On One? Dole Whip: “Dole Soft Serve Mix is a lactose free dry mix that is reconstituted with tap water and frozen down in a soft serve machine. Marketed under the popular Dole brand name, this unique product delivers an intense, natural pineapple fruit flavor, yet is fat free and cholesterol free.”. That phrase – while being technically accurate – fails to capture the joy your tastebuds experience when introduced to a Dole Whip. Imagine yourself miserably hot and humid – you dread moving because that’ll just make you even hotter. Then someone (maybe an angel) hands you a dish of a cheerful yellow, softly frozen pineapple (flavored) treat. From the first bite, your outlook brightens while visions of hula girls dance in your head. Okay, that might be a little bit of over-sell but Dole Whips are just plain wonderful! My whole family loves them and we’ll use any excuse to get one. Under the light of harsh scrutiny, they’re probaby just another icecream-like product but just try telling that to the fans. Where to Buy A Dole Whip? Dole Whips mixes are sold to ice-cream vendors throughout the United States but they sure don’t seem to be found on every corner. Most people who land on this blog will want to know where to find a Dole Whip at Walt Disney World. Magic Kingdom Theme Park – Adventureland Area – Aloha Isle. This refreshment stand carries both pineapple and vanilla Dole Whip. You can also get pineapple spears, pineapple juice, and Dole Whip floats here. If you’re on a Disney Dining Plan, you can use one of your snack credits to get a Dole Whip. There are those – even in my own family – who get sprinkles on their Dole Whips. Sprinkles!?!? Yuck! TIP: If there are multiple lines, check to see which server gives the bigger servings and get in that line. Orlando, Florida – Walt Disney World Resort – Disney’s Polynesian Resort Hotel – Captain Cook’s Snack Company. The hotel food court sells Dole Whips but doesn’t carry as many items as Aloha Isle, in the Magic Kingdom. No sprinkles here. TIP: My family loves to buy a Dole Whip at Captain Cook’s just before going out to the Polynesian resort’s “beach” area to watch the Magic Kingdom fireworks and the Electric Water Pageant (floating parade). This is one of life’s simple pleasures. Anaheim California – Disneyland Theme Park – Tiki Juice Bar. Did you know that the Tiki Birds were the first Disney Animatronic figures? The Disneyland show hasn’t experienced the hostile take-over by Iago that you endure at the Magic Kingdom – it’s delightfully “old school”. Do Dole Whips Come In Any Flavors Other Than Pineapple? According to the manufacturer’s website, the Dole Whip mix does come in six flavors: Pineapple, Orange, Mango, Raspberry, Chocolate, and Vanilla. Disney sells pineapple and vanilla flavored Dole Whips; I’m not sure where you go to try the other flavors. Strangely enough, there is a small minority of people who think Dole Whips are terrible. There are also some people who think Dole Whips are entirely over-rated – they aren’t bad; they’re just not amazing. I’ll admit that nostalgia may be part of the attraction since many people experience these for the first time while on vacation. Are you the type of person who asks for the nutritional analysis of a precious little puppy or a rainbow? Clearly you’re confused about the purpose of a Dole Whip…this isn’t about nutrition. If you need to know, you can find all that stuff on the official website. 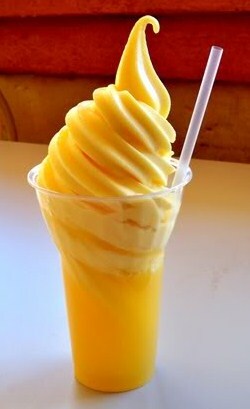 You Need A Disney Vacation and a Dole Whip….Pronto! The kind of people who selflessly eat Dole Whip after Dole Whip – just to be sure they’re something you would want to try – are the kind of people you need to help make your Walt Disney World Resort Vacation great. You’ll get all the benefits of our expert Disney dessert taste testing when you book your next trip through www.buildabettermousetrip.com Remember, we ate all those Dole Whips for you! Is Fantasmic! at Walt Disney World Too Scary For My Child? Should I Take My Small Child To See Fantasmic! at Disney’s Hollywood Studios Theme Park in Orlando, Florida? There’s a show at Disney’s Hollywood Studios called Fantasmic! and it is only offered a couple of times a week. It’s about 26 minutes long and is very popular – however, there is a fairly significant villain section in that lasts about 8 minutes and it includes a dragon. This article will give you all the information you need to decide whether or not the Fantasmic! show at Disney’s Hollywood Studios is appropriate for your child. Fantasmic! is an impressive show and is generally suitable for older children and adults but it may not be appropriate for preschoolers, anyone who does not yet comprehend the difference between reality and make-believe, or to individuals who are prone to nightmares. What Fantasmic! Is All About – A Brief Outline of the Plot of Fantasmic! Stylistically, Fantasmic! may remind you of Fantasia, Mickey’s Philharmagic (3-D attraction at the Magic Kingdom), or the Disney Silly Symphonies. There is very little dialogue and most of the action corresponds with the tone set by the musical score. There are live action sequences with characters from the Disney movies along with familiar images being projected on a screen of water mist. The storyline follows the classic Disney model of a fairly peaceful beginning, followed by a conflict with a villian, good overcoming evil, and a happy ending. In this case, Mickey is having a dream but his imagination runs away with him causing a montage of classic Disney villians come to intimidate Mickey – in the end, he announces “Hey, this is my dream!” and everything goes back to happiness and dancing princesses. Although the story itself is very simplistic, adults will be impressed with the elaborate affects and scene changes. Lightning, giant puppets, fountains, mist screens, flames, and pyrotechnics are impressively incorporated into this spectacular production. If you have any concerns about your child becoming frightened or upset by Fantasmic!, we highly recommend you take the 27 minutes necessary to watch the Fantasmic You Tube video we’ve embedded in this post. You know your child best so you will be able to evaluate the show and pick up on any less obvious elements that might frighten your child. The list below includes some of the things in the show that we think could be potentially frightening to preschoolers or timid souls. Starting at about 7:19 minutes into the youtube video – or about 7 minutes into the show – you’ll notice that the tone of the music and the images starts to change in subtle ways. The whale from Pinocchio is projected onto a screen, there is a fight scene from the movie Pochahontas, and we start to see some elements of conflict introduced into the plot. Mickey, in the Sorcerer Mickeycostume, gets caught into a typhoon and calls out “What’s Going On!?!”. The most intense portion of Fantasmic begins at about 13:45 minutes into the You Tube video or about 13.5 minutes into the actual show. Maleficent (from Sleeping Beauty) appears and threatens Mickey Mouse. Her image is always a bit frightening but we also see the images of other Disney villians like Ursula (Little Mermaid), Hades (Hercules), Jafar (Aladdin), Cruella (101 Dalmatians), & Scar (Lion King) morph from one to the next on a mist screen. The voice track during this portion is ominous. Later on, this segment also includes some wraith, ghost, dragon or demon figures set to the more intense portion of the soundtrack. At one point, the entire lake catches fire, with actual flames (approximately 21 minutes into the show). People in the lower rows can actually feel the heat from these flames. Flames, in smaller amounts, are also used in other scenes. A comet-like ball flies through the air and causes a bright flash in the scene from Pocohontas. Flames and flashes are a part of Maleficent’s spell. There is live action snake-like dragon with glowing eyes that appears and moves menacingly. This occurs between 16:30 – 17:35 minutes and at 20:43 – 22:45 minutes into the video and roughly around the same duration into the actual show. This dragon gets absolutely huge. Depending on the maturity of your child, the following tips may help your child enjoy Fantasmic and deal with the scary portions. Tell your child the whole storyline or let them watch the You Tube video – knowing what to expect in advance can make the intense sections manageable. Don’t worry about spoiling the show; young kids love familiar things – think of how many times they’ve watched their favorite DVD. Do you have a smart but sensitive older child? Consider arming them with good information and technical details.Tell them that the whole lake will catch on fire. Then explain that Disney uses a carefully measured amount of propane that will float on the water. Assure them that Disney has practiced this over and over so they know the exact amount of gas to use to burn the exact right amount of time. If they express concerns about accidents, tell them that the concrete steps and metal bleachers are not things that easily catch fire.Show your child the snake segment (16:30 – 17:35 minutes into the video) and talk about how it is regular humans that are carrying each segment of the snake. You can show them this You Tube Video of the Chinese Dragon Dance to show how it is done. Give your child a “weapon” for self-defense. Some people may find this method objectionable but many, many years ago, my son was frightened by the Pirates of the Caribbean ride. His grandma purchased a plastic sword from the gift shop and gave our son permission to fight off any pirates that attacked us on the ride. She carefully explained the difference between pirates and the other tourists in the boat. My son brandished his sword throughout the ride, managed to avoid whacking any of the other guests, and felt brave throughout the whole experience. If you don’t want to buy a sword, consider teaching your child a few good karate chopping motions accompanied by “Hi Yah!” type exclamations before going into the show. The ability to defend oneself goes a long way towards feeling confident in this world. We’ve given you approximate show times for the most intense, potentially frightening portions. You may be able to distract your child with a snack or a toy. Failing that, you can always take them to the restroom beginning about 12 minutes into the show. If you plan to use this tip, try to sit at the edge of a row so you won’t be stepping over other people as you make your way to the aisle. Always keep in mind the possibility that you may have to come to your child’s rescue by taking them out of the show, should it become too frightening. You have a choice here – you can react with irritation at the fact that you had to leave the show and you can belittle your child for being frightened. Or…(and this is what we recommend) you can be your child’s hero by protecting his/her precious heart and mind until she/he is older and better able to deal with these types of images. Keep smiling, assure your child that you didn’t mind leaving the show, and tell him/her about a time when you were a child and got frightened by a movie or a scary story. Let your child know that you’re on their side. Remember that you’re making memories – they can be memories of shame and frustration or this can be a situation where you child sees that they can trust you with their fears and with their feelings. The entrance to the Fantasmic! Amphitheater is on Sunset Blvd., between the Beauty & the Beast Live! stage and The Twilight Zone Tower of Terror ride. Except during peak travel times, Fantasmic! is no longer offered every night of the week so check the Walt Disney World calendar of events before you go and plan to visit Disney’s Hollywood Studios theme park on a day when the show is offered. Avoid any day where Disney’s Hollywood Studios has an “Extra Magic Hour” (special times reserved just for Disney resort hotel guests) and Fantasmic! The combination of these two things will make Disney’s Hollywood Studios disproportionately busy on days that offer both incentives. Fantasmic Dinner Package – You reserve an early dining time (generally before 4:20PM) and you receive a voucher for a spot in a reserved section. This can save a lot of time you would otherwise spend in line. The three restaurants that participate in the Fantasmic Dinner Package are Hollywood & Vine (buffet), Mama Melrose (Italian), and the Hollywood Brown Derby. The Fantasmic Dinner Package reservation must be confirmed with a credit card and you will be charged a “no-show” penalty if you skip the reservation. There is a 48 hour cancellation policy.Are you on a Disney Dining Plan? The Fantasmic Dinner Packages at Hollywood & Vine and at Mama Melrose each only take one Disney Dining Plan table-service credit per person; the Hollywood Brown Derby is a Signature Dining Location and will require two table-service meal credits per person.There is very limited availability for the Fantasmic Dinner Package so reserve early (up to 180 days prior to arrival). You must specifically reserve a “Fantasmic Dinner Package” to receive these benefits. These restaurants will have regular reservations available that do nto include the Fantasmic seating vouchers. You don’t have to have a Fantasmic Dinner Package to see the show. It is included as part of your admission to Disney’s Hollywood Studios theme park. However, the show may fill to capacity. The gates open about 90 minutes prior to the show and, during busy seasons, it is essential to line up at least 70 minutes prior to showtime. It may be possible for one parent to hold a place in line while the other parent gets food at Catalina Eddie’s, Rosie’s All-American Cafe, or the Backlot Express to eat while you wait for the show to start. Combining mealtime with waiting time will reduce the sense that you are wasting time. There isn’t any meal type food sold inside the amphitheatre but snacks like popcorn and sodas are available for sale. There are restrooms inside the theatre. Are there two performances of Fantasmic! on the day you’re visiting? If so, the second performance will always be less crowded than the first. The other advantage to the second performance is that it gives you more time to enjoy Disney’s Hollywood Studios theme park rides and attractions. There are no bad seats but we think theseats just to the right or to the left of the center from the middle row of the amphitheatre back to the top row are the best seats. This show has a pretty wide scope so sitting too far forward can actually make it harder to take it all in. The show is about 25 minutes long. Your showtime might be such that you have about an hour of park time after the show ends. If you hope to get in a few last rides after the show, consider sitting on the right side (as you face the stage) so that you’re closest to the exit when the show ends. Get up and leave promptly so that you don’t get stuck in a slow moving crowd. Theme Park Touring Plans – Remember that you’re going to have a better time if you have a good touring plan. It just so happens that we provide three great options for touring plans when you book your Walt Disney World Resort vacation through Build A Better Mouse Trip. Note: Disney’s Hollywood Studios theme park used to be called Disney-MGM Studios.